How about having a guy hold up a cardboard sign that says LIGHTNING!! on it at the right moments? OK, we cant do a big strobe. Hmmmmm. I'm old. Old enough to remember a time before electronic flashguns for photography were affordable, and before these we had flashbulbs, which I remember well. Flashbulbs were merely a convenient repackaging of a technique used from earliest days of photography, the magnesium flash powder lamp. Perhaps a variation of this could be used to deliver the goods? Not the safest technique in the world, but with attention to risk management, possible to do adequately safely. I seem to recall reading somewhere that these things can be run off a genset, but the genset won't like it, so has to be effectively dedicated to the strobe, and be of adequately rated power. Would be hard to get the timing (cue) and delivery method down, but the key to a magnesium fire is the water. There was an early electrical lightning effect which consisted of a carbon arc device connected to a solenoid. I've read about the old carbon arc lightning thing but never seen one. I do have some experience with carbon arc lamps though, mainly as light sources in cinemas. And have stood next to a variety of world war two era searchlights powered by carbon arcs. Its fun stuff, but even the biggest arc lamps I've seen were a couple of tens of KW. As an aside: The first theatre followspots I ever saw live were carbon arc searchlights, back in the early 60s. 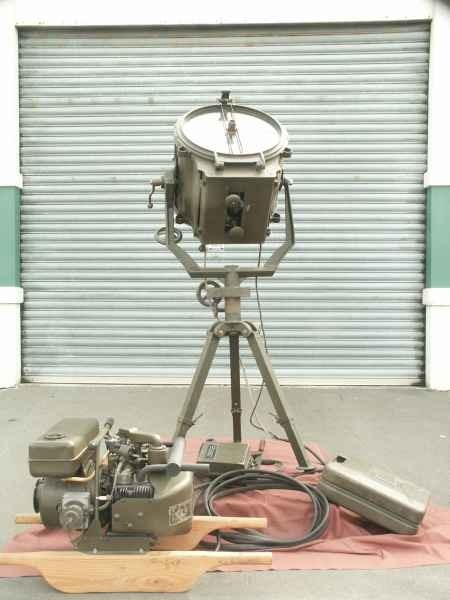 Searchlights just like this one, rated at 2.5KW, though without the generator! Image from the waaaaaayback machine.